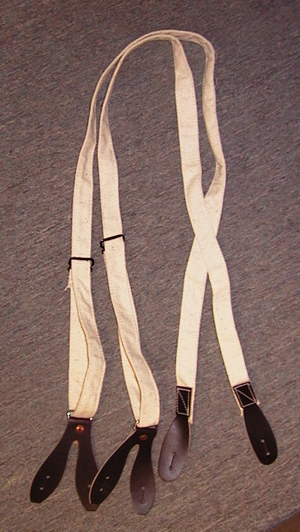 Featuring a folded cotton duck strap with correct prong buckles and leather ends. These are a close replica of those worn during the mid 1800's. We have made these in our shop since 1985. Quality Guaranteed. Good for your authentic impression. These work well for either military or civilian impressions. 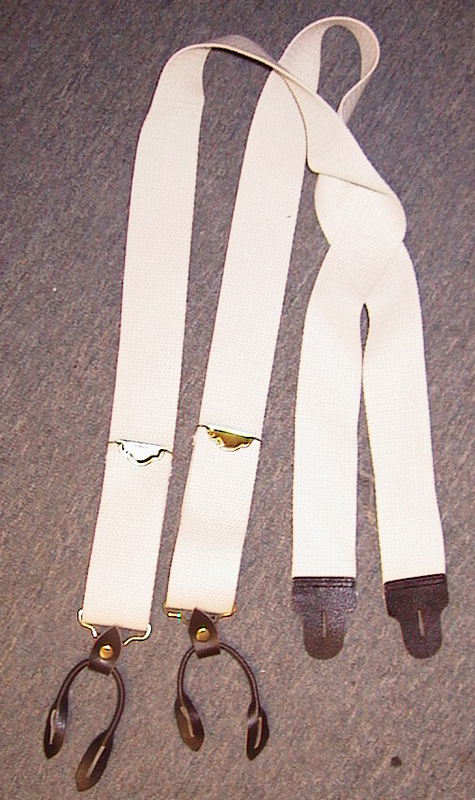 The straps do not roll up with use, but stay flat for a more comfortable fit. Fully Adjustable to fit just about anyone from small to very large sizes. Can be adapted for kids as well with a simple procedure. Made from 2" webbing with a friction buckle. Features a snap closure at the end with a double ended leather tab. These are not authentic for Civil War era reenacting, but may fall into slightly later periods. Will fit a fairly large individual, but adjustable for small sizes as well. To Return to "Clothing Accessories"